I am one of the co-authors of this guidebook. Paul Jenkinson is the other. I am responsible for the Cwm Silyn, Dyffryn Nantlle and Cwm Pennant sections, with Paul writing the descriptions of Castell Cidwm, Llechog and the crags around Beddgelert forest. These areas were meant to be combined into the recent Tremadog and Meirionydd guides as one volume, though this would have resulted in a huge guide! Then, it was going to be packaged with the forthcoming Cloggy guide, but this fell through. 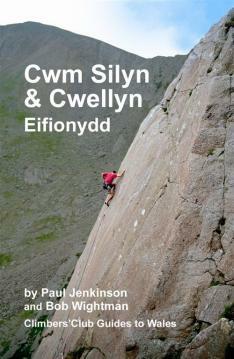 The two guides (Cloggy and Cwm Silyn) were then to be be separate guides but sold as a pair. That idea also fell by the wayside resulting in this guide appearing some time (November 2003) before the Cloggy guide.